More often than not, a new year means new goals. You’ve probably thought of a few, like “Grow my business” or “Get more sales,” but have you worked out a strategic plan to ensure you achieve those objectives? If not, you’ve come to the right place. This article will outline some simple, yet highly effective ways of accomplishing your goals this year. At this early point in 2017, are you still reflecting on how you did with last year’s goals? Maybe you were able to hit some, but if you are like most small business owners, your resolutions didn’t go as planned. In fact, only 9.2% of Americans reported being successful in achieving their new year’s resolutions. Changing the course of your business or a particular behavior is an incredibly challenging task. You need a lot of energy and a strong focus on what needs to be done, not just in the beginning, but throughout the year. Maintaining that energy level and laser focus is tough. In fact, six months into the new year, at least 55% of people have given up hitting their goals. And, what’s worse, once you’ve given up, it’s easy to fall into the trap of self-pity. So, instead of beating yourself up on those things that you didn’t quite master, try focusing on where you did succeed and be mindful of the hard work it took to get you there. And here’s the good news: you’ve got a clean slate going into this new year. “False Hope Syndrome” is the act of setting the bar too high. Psychology professor Peter Herman and his colleagues came up with the terminology, stating that “…people fail because the resolutions that they make are unrealistic. They’re overly ambitious in that they try to accomplish more than they realistically can. They also try to accomplish more things more quickly than is realistically possible and they underestimate the difficulty of the task.” While there’s nothing wrong with setting lofty goals, you have to be realistic. Set yourself up for success with goals that are challenging, yet achievable. Remember to KISS complexity goodbye when coming up with your goals. In this case, KISS is a principle that stands for “Keep it simple and straightforward” (or you may affectionately know it as “Keep it simple, stupid,” but the aforementioned popular variation works better in this case.) Keeping your goals uncomplicated automatically makes them easier to achieve. Why? Simplicity brings clarity, and clear goals are easier to understand and attain. Now that you are in a positive frame of mind, have gotten rid of false hopes and are focused on simplicity, it’s time to start creating your goals. The most ideal process for this is (cleverly) called S.M.A.R.T. goal setting. 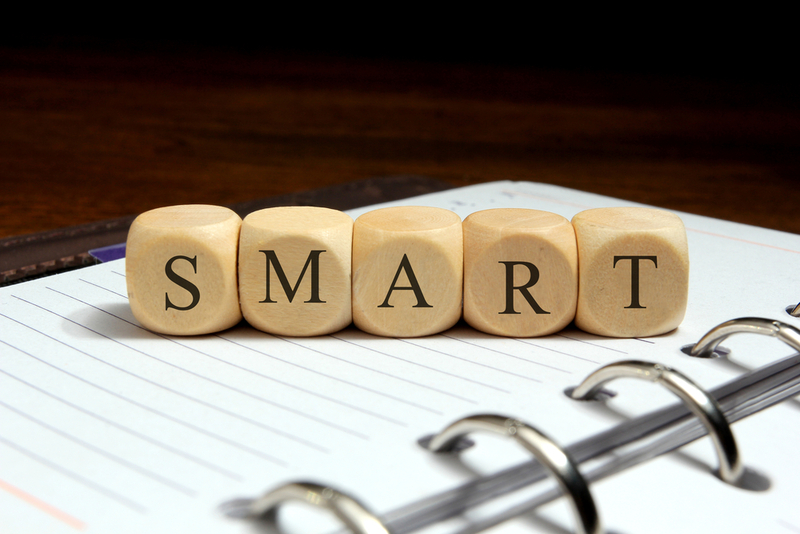 As popular as SMART goal setting has been, it has not been around for very long. It originates from a paper published in 1981 by George T. Doran, titled “There’s a S.M.A.R.T. Way to Write Management’s Goals and Objectives.” In the paper he states “‘…when it comes to writing effective objectives, corporate officers, managers, and supervisors just have to think of the acronym SMART. Ideally speaking, each corporate, department and section objective should be: (SMART).” The SMART methodology he referred to is one that created an entirely new way of writing, organizing and applying energy towards successfully achieving goals. The business world has wholeheartedly embraced it. For every goal you want to achieve, document it using the SMART methodology. Doing so will make you more motivated and more apt to succeed. Let’s break down each part, with examples, so they make sense. Using an example, let’s say your goal for this year is to “Get more sales,” but when you analyze it further, you find it is entirely too general. It’s best to include specifics so that you know when you’ve conquered the task. Changing it to a more specific goal, such as “Increase 2016 widget sales revenue by 20% by December 31, 2017,” makes more sense. The details form a goal that is much easier to grasp, understand and accomplish. Quantifying your goals provides a simple and clear way of measuring progress and achievement. When your goals include numbers, the quantitative results of your efforts provide undeniable evidence of success (or failure). Using a new example, let’s say that your goal is to “Write a book.” Can you see how that goal is too general? It’s not specific, nor is it measurable. To fix it, the goal should be rewritten to say, “Write two pages a week to create a 100-page book on my top tax tips by December 31, 2017.” The numbers and timeframes provide precise measurements for seeing where you stand in the year-long project. This example also shows that breaking your goal down into measurable chunks (i.e., two pages a week) makes it easier to digest, and therefore conquer. You may have noticed that each one of the re-vamped examples above has had timeframes assigned to them. Each of your goals should have a target date for completion. Including dates creates a sense of urgency to hit your goal. Without a deadline, it’s much too easy to put it off. For example, a goal of “Get a business phone” can be delayed with ease. However, “Invest in a professional business phone system by April 2017” will be less likely to be delayed. 13% had goals but never wrote them down. Only three percent had written down clear goals with plans to accomplish them. The 13% who had goals but didn’t write them down were earning, on average, twice as much as the 84% who had no specific goals. The three percent who had written down their goals were earning, on average, ten times as much as the other 97% put together! So write down your goals. It will certainly be worth the effort. In addition to writing down goals, referring to them often is essential for success. Keep your goal sheet handy, not hidden away. Read through your goals at least once a month. Form a habit of reviewing them in a way that makes it enjoyable. Schedule the time in your calendar so that you can read through your goals and reflect on your progress with each. Track milestones and reward yourself as you cross them. Having at least twelve reminders throughout the year will help to keep you on track. If you write thoughtful, SMART goals, you’re more likely to truly believe that each one can be fulfilled. And believing is half the battle! Cultivate optimism around each goal, and focus on the positive results each will bring–not only to your business, but to your life. Believing and envisioning those incredible outcomes offers a constant source of fuel for you and your team to keep working at them. Most importantly, think about how you’ll reward yourself or your team once each goal is accomplished. Make it compelling so that it provides motivation and determination for you or your team to fulfill each one. And don’t forget to acknowledge and thank all of those who helped to make it happen. From our magicJack family to yours, we wish you all the best in reaching your goals, both this year and beyond.